St Maarten � You�ll Be Back! 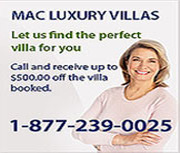 MAC Caribbean Luxury Villas donated a stay at the beautiful Jardin Creole villa, which raised $15,000 for the Children’s Aid Foundation (CAF). MAC Furnished Residences also provided a $5,000 Scholarship to CAF, helping youth that are at most risk. The CAF is an independent charity that helps Canada’s most neglected and vulnerable children/ youth reinvent their lives by giving them the support and skills they need. Through prevention, education, and enrichment, CAF works hard to help youth break the pattern and overcome the barriers of poverty… something MAC strongly supports. Since 1991, the Philpott Children’s Tennis Fund has helped introduce Toronto’s inner-city children to tennis. MAC Furnished Residences is assisting by sending 140 at-risk children to tennis camp for the summer of 2013.